In the short span of three years, Chris Morelli and the girls of his flag football team went from experimental to undefeated. It was a learning process for everyone involved, but Morelli had the utmost confidence in his girls and himself. His confidence has paid off, and now he is the Southern Nevada Flag Football Coaches Association’s Clark County School District Coach of the Year. 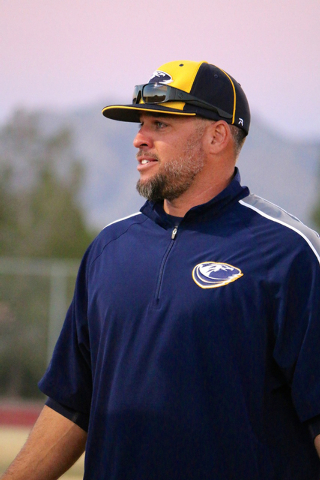 Morelli, who already coached junior varsity baseball, was named head coach when the program came to Boulder City. Since Morelli had never been involved with girls sports before, he was a little timid, and unsure how to proceed. None of the girls had ever stepped foot on a football field, let alone knew how to throw a football. It was going to be a matter of trial and error, but Morelli and his team were ready for the challenge. Morelli now claims his flag football team is the most dominating team he has ever been around. Last year, the team had one loss, leaving its record 20-1. This year, the girls were undefeated, 22-0. With his new team accomplishing so much in a short amount of time, Morelli has received a lot of attention. In addition to the honor voted upon by his peers — and last year’s accolade as Sunrise Coach of the Year — he was recently promoted to varsity football coach for Boulder City, in addition to his other sports. But as honored as he is to be receiving the attention, he said he believes the attention should be focused on the girls because they are the ones that worked so hard to accomplish so much. “I just want to make sure that they get all the credit. It’s their hard work,” Morelli said. It might be the girls’ hard work, but senior Logan Kanaley said the team would be not where it is without Morelli believing in them every step of the way. She said it was him who made all those girls believe that they were athletic and might actually be good at something. He made those girls believe in themselves, and that is what gave them the strength to carry on. Even though Morelli had no experience teaching a girls team, he said he discovered he didn’t have to change his coaching style much. The girls embraced the toughness of the sport, and poured all their time and energy into it. No matter the sport, Morelli uses coaching sports to teach his players about adversities they may face later in life. The flag football team had a motto: five seconds. Kanaley describes it as a metaphor for life. Morelli said he doesn’t put limits on his players. He tells them what they can accomplish, what the end goal is, and his teams run with it. He pushes his players to get everything he possibly can out of them, to ensure they will never regret giving 100 percent for any reason. Whether Morelli is coaching baseball, football or flag football, he said he wants to show his players that there is more to life than sports. So often, people get so wrapped up in sports, they forget about the more important things in life, he said. Because of the success of the flag football team this year, Boulder City is sending six players to the Sunrise versus Sunset All-Star game on May 20. 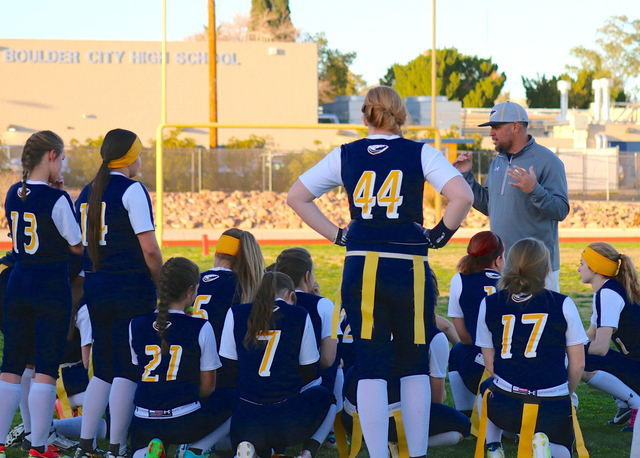 Boulder City hosts this year, and Morelli said he couldn’t be more proud of his girls.